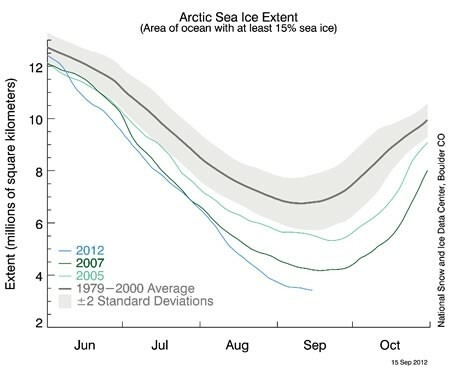 In 2012 the smallest Arctic ice pack on record coincided with the northern hemisphere’s warmest recorded summer. This year 500,000 square kilometres of Arctic sea ice melted—more than ever before recorded. As darker open waters accelerate the melt by absorbing more solar radiation, statistics give rise to a new wave of concern: sea ice plays a critical role in regulating climate, in acting as a giant mirror to reflect the sun’s energy, and in helping cool the planet. Michael Mann, Director of Pennsylvania State University’s Earth System Science Center reported in October that Arctic sea ice is ‘declining faster than the models predict.’ The longer term implications are hard to call, say climate scientists, who caution that more research is needed. Obtaining reliable measurements of changes to sea ice was difficult until the satellite era began in the early 1970s. Now, NASA satellites pass over the polar region several times each day to gather data. The ongoing rise in average global temperatures, which has accelerated Arctic ice melt, has been largely attributed to the burning of fossil fuels and the resultant increase in greenhouse gases in our atmosphere, such as carbon dioxide. Since the year 2000, Aurora Expeditions has operated eco-voyages to the European Arctic: specifically to Spitsbergen, the main island of the Svalbard Archipelago, and across the Greenland Sea to the fjords of East Greenland. Over twelve seasons our long-term expedition staff members have witnessed dramatic changes in sea ice extent, and noted visible evidence of glacial retreat, with more moraines visible at the coast. One example is Brepollen in Hornsund in southern Spitsbergen where five large glaciers empty into the fjord. Comparing the ship’s navigational charts from the year 2000, the glacier has now retreated almost two kilometres, allowing our ship to motor further up the fjord through open water that twelve years ago was covered by glacier. Conversely other parts of the Arctic have seen more ice this year; with the Bering Strait being clogged until late in the season. Is the Antarctic sea ice melting as rapidly? Sea ice surrounding the Antarctic Peninsula has recently experienced a significant decline. Interestingly, east Antarctica, the Ross Sea region and the Antarctic continent south of Australia has recorded a small increase in sea ice. Antarctica and the Arctic react differently to climate change partly because of geographical differences. Antarctica is a continent surrounded by ocean, while the Arctic is an ocean surrounded by land. Wind and ocean currents around Antarctica isolate the continent from global weather patterns, keeping it cold. In contrast, the Arctic Ocean is inextricably linked with the climate systems around it, making it more prone to climate change. One of the great highlights of an Aurora Expeditions’ Arctic voyage is to witness the mighty polar bear in its natural habitat—Spitsbergen offers premium prospects with a population exceeding 2,000 bears. But the loss of Arctic ice is now the leading threat to polar bears and in a sad irony, as the pack ice has diminished over recent years, our sightings of polar bears have increased. Bears stranded on land roam the shorelines foraging for birds, berries and carrion. Out on the sea ice, a polar bear’s staple diet is ringed seal, with an adult bear needing to eat about one seal each week. This season’s observations indicate that the diminishing areas of sea ice have resulted in a greater concentration of polar bears out on the pack ice hunting seals. Against a backdrop of change and an uncertain future, our continuing quest is for our passengers to experience the wonders of the Arctic firsthand, and to foster a greater understanding of the dramatic forces of nature at work. Now more than ever, Aurora Expeditions’ urges those lucky enough to voyage to this extraordinary realm to return home as ambassadors for its protection. Great memories Dean. I remember being with you when you were shooting some of this. Aurora Expeditions launches its first ever Polar Voyages Brochure for 2013-14. In keeping with the company's continued efforts to be environmentally friendly, they have produced just one brochure encompassing all of their spectacular voyages to Antarctica and The European Arctic over the next eighteen months. Available in ebook and printed format, the new brochure showcases some of the most spectacular Polar regions on earth; introducing readers to the concept of enriching travel through close encounters with wildlife, breathtaking scenery, informative talks and small group camaraderie (groups of 54 or less). Aurora Expeditions voyages Polar voyages 2013 and 2014 are expected to fill fast, with Fly/Sail options to the Antarctic Peninsula already showing strong demand. Departing South America, these voyages have been designed to reduce sea time and increase time at the destination. The New Across the Arctic Circle voyages are also showing particularly strong demand, giving passengers the opportunity to sample the Scottish, Norwegian and Spitsbergen coasts over 14 days. With adventure levels to suit all tastes, exciting activities across the program include sea kayaking, camping, photography, climbing and polar scuba diving. Aurora Expeditions, the pioneers of ship-based adventures, are committed to small, low-impact groups keen to experience the Polar Regions in many ways whether by walking, scuba diving, sea kayaking or sitting quietly and absorbing the surrounding magnificence. The 2013-14 itineraries reflect this commitment. Voyages to The European Arctic start from AU$5,900 and to the Antarctic Peninsula from US$6,365. Aurora Expeditions can also book your full travel arrangements: flights, hotel accommodation, tours and transfers, making them a one stop shop for your trip of lifetime. Ship accommodation. All public areas are open to passengers. Medical services. There is a resident medical officer and well equippedclinic on board. Port taxes and port charges imposed by government authorities.pre-departure information. Air transport to and from the ship. Optional excursions not included in ship cruise itinerary. Laundry, postage, personal clothing, medical expenses, personal travel insurance and items of a personal nature such as bar charges, phone calls and optional end of voyage tips. Credit card surcharge, if making your final payment by credit card. 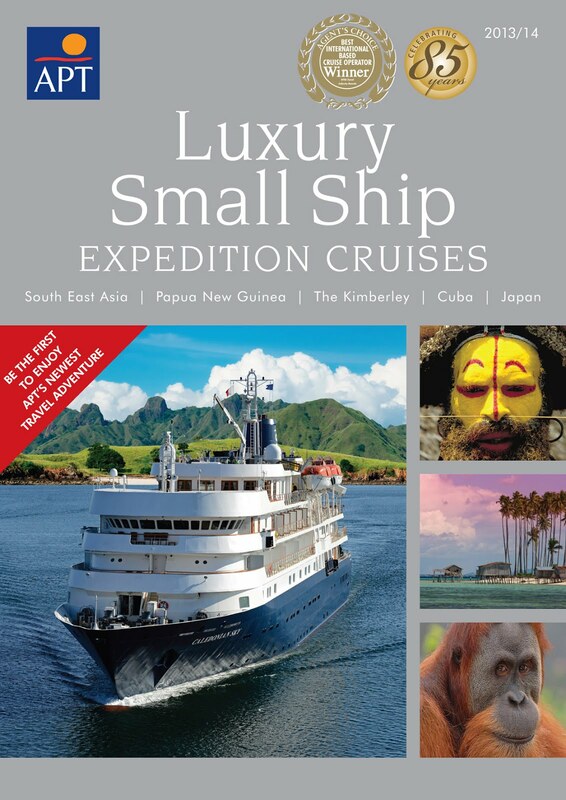 During March and April 2013, the award-winning expedition cruise ship Orion will again provide a very civilised and luxurious way to explore the coast and islands of near-neighbour, Papua New Guinea. 11-night itineraries conveniently commence and conclude in Cairns, Queensland, seamlessly incorporating a charter flight direct to or from the ship in Rabaul for boarding or disembarkation. Discover the photographer-within or anthropologist-within as you explore this land of over 800 languages and a diversity of largely self-contained cultures that will challenge the imagination. Until relatively recently Papua New Guinea was still perceived as an isolated world of head-hunters; a land of mythology, sorcery and witchcraft. Bypassing the main towns, as Orion does, many villagers have only been exposed to the modern world through the workings of missionaries and occasional traders. Yet step ashore with members of Orion's specialist expedition team and you will be greeted with broad smiles and warm welcomes from gentle villagers - an eye opening introduction to a way of life far removed from our Western world. Between 1920 and 1926 famed Australian Antarctic photographer, Frank Hurley, visited New Guinea, returning with a portfolio of stunning black and white images. Men in dugout canoes, women carrying babies in string bags, delicate shell and feather ceremonial decorations, intricate tattoos; amazingly, photos of scenes that could have been taken this year so little has changed in a century, perhaps many centuries. On these Orion voyages encounter primitive tribal cultures (and perhaps purchase superb indigenous artwork and carvings), see unique flora and fauna and enjoy luxuriant snorkelling and fishing in warm indigo and cobalt blue waters, home to some the world's most prolific marine and coral life. In Rabaul, volcanic Mt Tavurvur grumbles, expelling smoke, gases, ash and volcanic rocks from deep within the earth. Here Admiral Yamamoto directed much of the Japanese Pacific campaign and the detritus of World War II lies scattered for your examination. Tufi's villages are situated within a picturesque series of jungle clad volcanic fjords, tribal cultures unchanged for centuries; while the colonial town of Madang conjures scenes of a Conrad or Hemmingway sitting in a cane chair well positioned to catch the afternoon breeze, sipping pink gin. Orion's voyages to Papua New Guinea provide modern day explorers with the opportunity to venture to places far from mainstream tourism, yet to do so in the company of like-minded fellow travellers, in comfort and safety and without sacrificing creature comforts. Priceless experiences that will stay with you for life. 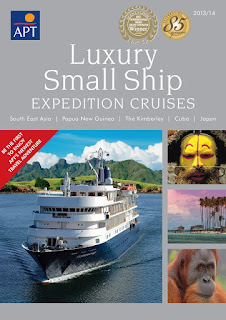 For reservations or to obtain a 2013 brochure call Orion Expedition Cruises: 61-2 9033 8777 (Sydney callers) 1300 361 012 (regional and interstate) / 0800 444 462 (New Zealand) or see your travel agent. To celebrate their new partnership with Zegrahm Expeditions, Cruiseco is offering its passengers US$2,000 air credit when booking any of the below cruises. Amber Wilson, Cruiseco's National Marketing Manager says that they are proud to partner with Zegrahm Expeditions. "As one of the most established luxury operators of small ship expedition cruises and overland adventures, we are excited to offer our customers Zegrahm Expeditions' wonderfully unique cruises. These expeditions explore the remote and the exotic. For those travellers who think they have already seen and done it all, Zegrahm certainly has something to offer," says Wilson. Enjoy an 18 days/17 nights' cruise from Singapore (return). Visit the World Heritage Site of Malacca in Malaysia and search for wildlife in Gunung Leuser National Park, known for its population of orangutans. From US$11,980 per person. Terms and conditions apply. Offer is subject to availability. Enjoy a 17 days/16 nights cruise from Hanoi to Siem Reap. Cruise south along the 1,000 mile-long coast of Vietnam, stopping to discover new wonders including the World Heritage Sites of Hue, My Son, and Hoi An. Highlights of this journey is a two-day exploration of the jungle temples of the Khmer and Champa Empires including Angkor Wat. From $10,980 per person plus. Terms and conditions apply. Offer is subject to availability. Cruise for 15 days/14 nights from Belize City to Puerto Caldera (for San Jose). The expedition reveals the wonders of five Central American countries: Belize, Honduras, Colomia, Panama, and Costa Rica, two oceans and the Panama Canal. From $11,980 per person. Terms and conditions apply. Offer is subject to availability. Cruise for 15 days/14 nights from Bandar Seri Begawan, Brunei to Bali. Begin your journey on the island of Borneo to experience the elegant palaces and mosques and observe the gentle organutans in Sabah. Cruise to Sulawesi for a visit to Toraja to view the carved architecture. See the legendary Komodo dragon up-close on Komodo Island. From $11,980 per person. Terms and conditions apply. Offer is subject to availability. Enjoy 16 days/15 nights cruising from Benoa (Bali) to Manado. Immerse yourself in the magic of Bali with beautiful temples, scenery and art. Snorkel or dive in the clear waters of the Flores Sea and step ashore on Komodo Island to view the world's largest lizard. From $10,980 per person. Terms and conditions apply. Cruise for 18 days/17 nights from Manado to Port Moresby. Begin adventure begins at Bunaken National Park. Visit the fascinating cultural and historical sites on Ternate Island, long fought over for its bounty of cloves. Explore the Raja Ampat archipelago and visit remote tribal villages. From $11,980 per person. Terms and conditions apply. Offer is subject to availability. 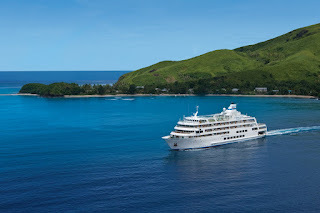 Cruise for 14 days/13 nights from Port Moresby to Palau. This far frontier of the western South Pacific (including the outer islands of Papua New Guinea, Yap and Palau) hosts traditional cultures and tropical landscapes. Experience soaring volcanic peaks to submerged craters teeming with fish and meet with native Melanesian and Micronesian people. From $10,980 per person. Terms and conditions apply. Offer is subject to availability. Zegrahm Expeditions' fleet of ships have been specially selected for each charter. These include the Clipper Adventure, Clipper Odyssey,Isabella II, Kapitan Khlebnikov, Paulau Aggressor II, Sea Safari VIII, and the newly-added Sea Spirit. Russian Far East volcano Tolbachik erupts after lying dormant for 36 years, visit this region on one of our Russia 2013 voyages. The Plosky Tolbachik volcano (3682m) burst into activity on November 27 with impressive lava flows of up to 10km, volcanic tremors, and ash plumes rising to almost 10,000 feet. The activity has continued with Tolbachik continuing to produce more ash plumes, active lava flows, and lava fountains at the lower vent. 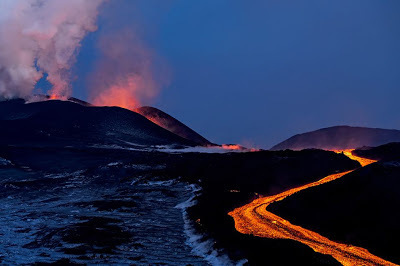 Plosky Tolbachik is one of 29 active volcanoes (of approx 160 in total) scattered over Kamchatka Peninsula – a 1,250km finger of land between the Sea of Okhotsk and the Pacific Ocean. The region is known as the 'Land of Fire and Ice' for very good reason. Volcanoes and numerous glaciers combine to create a spectacular ever-changing landscape. Experts predict this recent eruption may increase in magnitude and may last for some time. Heritage Expeditions 'Russia's Ring of Fire' voyage can take you to witness Kamchatka's impressive volcanic activity for yourself, not to mention the rich wildlife opportunities. As the most experienced and knowledgeable operator in the Kamchatka region, Heritage Expeditions offers expedition-style voyages to one of the most remote and exciting travel destinations on the planet that few have the chance to experience. 'Russia's Ring of Fire' 13-day voyage aboard the 'Spirit of Enderby' departs on 24 May 2013 starting from US $7100. Berths are still available on this expedition to the Russian Far East. Adventure Canada is a family owned tour operator that specializes in Polar Expedition Cruising in the Canadian Arctic, Greenland, Labrador, Newfoundland and other international destinations such as Antarctica, New Zealand and Europe. We are approaching our 25th year of operation and are located in Mississauga, Ontario, Canada. We are looking for a Senior Expedition Cruise Manager with experience in expedition cruising in remote Polar Regions for a 12-month maternity leave contract. Applicants must have a minimum of 15+ years in a management position and a minimum of 10 years of expedition travel experience in Polar Regions (Canadian Arctic & Antarctic). The candidate must have direct experience in logistical operations, shipboard operations, accounting, sales office management and human resources. Marketing & sales experience in the UK, Australasian and Russian markets are key for product development. Candidates with experience in small business environments and family business management will be given preference; as will applicants with direct experience and working knowledge of Sea Adventurer and expedition ships. Expedition field experience as Cruise Director and the ability to operate small watercraft and firearms is an advantage. An exciting expedition providing inquisitive explorers and photography enthusiasts alike the chance to improve their photographic skills while on location visiting a string of historically important, though rarely visited, islands just north of Australia. Orion's Forgotten Islands Photography Expedition. Along a visually stimulating path less travelled there will be ample opportunity to experience cultural, historic and geographic diversity, crossing the trade routes of the early navigators and traders who opened up this new world of spices, gold and pearls. Commencing in Bali, sail in 5 star luxury for 10 nights aboard the expedition ship Orion to Thursday Island in Torres Strait, then head south through the northern Great Barrier Reef to disembark in the north Queensland port of Cairns. Relive prehistoric times exploring Komodo to see the world's largest lizards. Growing to over 3 metres in length Komodo dragons these dominant predators are an impressive sight. Whereas they don't spit flames like mythical dragons they can be seen dribbling blood-red toxic ridden saliva after feeding - impressive subjects for photography. Journey to southwest Maluku; virtually inaccessible, these unspoilt islands appear to float on seas of blue and green shot silk. Very few outsiders set foot here and a unique cultural experience is guaranteed on Yamdena Island, the former Dutch trading colony, and the tiny island of Kisar with a heritage of 400 years of European history. Wide angle landscape or portrait lens here? Enjoy the languorous tropical outpost of Thursday Island in Torres Strait, with its pearling traditions and traditional ice cold XXXX beer. At Orion Reef snorkel (and try your hand at underwater photography) on this remote part of the World Heritage listed Great Barrier Reef, before the voyage concludes in Cairns. Every step of the way, guests will have the experience of professional still and video photographers Nick Rains and Pieter de Vries to help improve techniques and create stunning travel photography. Onboard photography workshops include professional advice and instruction on understanding and optimizing camera settings, framing your subject to capture the moment, printing, post processing methods and file management. Pieter will be holding workshops and screenings to help improve video skills, including how to create engaging story-telling sequences, filming animals, working from boats, tripod and handheld tips, and how to achieve the best possible audio. Invaluable information for owners of modern DSLR cameras with video capability. As on all Orion expedition voyages, the specialist Expedition Team, selected for their knowledge and practical experience in fields that include botany, marine biology, anthropology and history, will share their in-depth knowledge to enhance guest experiences. This 10 night Orion Forgotten Islands voyage provides a heady blend of local culture, European discovery, geology, unique flora and fauna all wrapped and presented in a series of beautiful islands forgotten in time. Priceless experiences that will stay with you for life. Junior Suites begin from $8,975 per person / Balcony Suites are $11,565 per person / Owners Suites are $12,025 per person. There's a lot of time to kill on some of the longer expedition cruises. Heritage Expeditions passengers found a particularly amusing timewaster. Enjoy! "Our top new trips have something for everyone, with familiar and easy destinations such as Alaska and Hawaii to exotic locales like the Arctic, Belize and the Adriatic Sea. Some of these trips are active with ample activities such as kayaking, paddle boarding and snorkeling while others offer easy wilderness or cultural cruising," said Todd Smith, owner and founder. He noted that the new trips were added to support growing demand from past clients who have indicated their preferences for Alaska, Antarctica and Galapagos. Smith, in late 2012 joined the ranks of Conde Nast Traveler's prestigious 13th Annual Travel Specialists List as the world's top expert on expedition cruising. "Three quarters of our clients this year were experiencing small ship cruises for the first time," said Smith, adding that 2012 sales are up 30 percent over 2011 and that 2013 sales are already 20 percent ahead of this point last year. Following is a sampling of five new itineraries some of which are currently offering booking specials. The increasingly popular Arctic thrills adventurers with sightings of polar bears, walrus and whales in Arctic Svalbard and Spitzbergen. While most Arctic trip itineraries focus on Svalbard and Iceland and depart from northern Europe, making them challenging for travelers in North America, Fabled Lands of the North begins in Ottawa and ends in Newfoundland, making it easier for North American travelers to explore the dazzling North. This itinerary explores the Canadian Arctic including Baffin Island and the Labrador Coast combined with the rugged west coast of Greenland. New bookings made by Dec. 31, 2012, can opt for complimentary charter airfare from Ottawa to Kangerlussuaq (a value of $1,200 per person). On the 36-passenger Wilderness Explorer guests spend significant time with the expedition team guiding them into some of Alaska's most scenic and untouched places. Although the lower passenger counts make the price point higher, the additional activity, says Smith, "makes it all worth it." Combine this with the company's Alaska Ultimate Adventure http://www.adventuresmithexplorations.com/itinerarydetails.php/advid/466 for Alaska's most extreme cruise tour. New bookings on any Alaska Unleashed 2013 departure receive a $100 per person shipboard credit through Jan. 11, 2013. With the second largest barrier reef in the world, countless island cayes, accessible rivers and small ports Belize is perfectly suited for small ship cruises. Remote mainland ports allow access to ancient Maya temples, pristine rainforest teeming with wildlife and the diverse cultures of Belize. Guests booking departures from Miami, Atlanta, Houston or Dallas-Ft. Worth can fly free, round-trip economy to Belize City or receive up to a $500 air credit. Hawaii is an active travel playground but traditional vacations miss the mark with crowded beaches and rushed activity tours. AdventureBound Hawaii offers an affordable and active small ship cruise experience for travelers seeking to experience traditional culture, meet locals, and discover a Hawaii most never know. All explorations include a slate of activities including stand-up paddle boarding, snorkeling, kayaking, and skiff tours with opportunities to go ashore for touring, hiking, or lose-your-cares beach time. The Adriatic Odyssey is an exciting new alternative to more traditional Mediterranean small ship cruises. By focusing solely on the eastern Adriatic this cruise offers a unique exploration of the lesser known and less crowded ports and historical sites. Guests who book a cruise departure by January 31, 2013 will receive a 50 percent discount for the second traveler. Solo travelers receive a discount on the single supplement (pay 25% supplement instead of the standard 50%). Founded in 2003, AdventureSmith Explorations is based in Tahoe City, California along the northern shore of Lake Tahoe. For information, availability and 2013 reservations Phone: 800-728-2875 toll-free, visit www.adventuresmithexplorations.com or Email: travel@AdventureSmithExplorations.com. New exciting voyages departing in 2013. Head to the far-flung British outpost, St Helena, in the Atlantic Ocean, onboard the historic and nostalgic, RMS St Helena. There is no journey like it. Travel in the company of Steve Owens, professional stargazer, dark skies consultant and author of the book, Stargazing for Dummies. Steve has many credentials, not least that in 2009 he set up the first International Dark Sky Park in the UK. He is working with St Helena, looking to protect their nightscape and benefit from dark skies. St Helena is steeped in astronomical history and this tour will allow you to stargaze from a truly unique place. Among other places, you’ll visit the sites of Halley’s observatory, he of comet fame. The Hideaway Tour focuses on the many aspects of St Helena’s landscape, from the historical to the environmental. The tour is led by Professor Colin Lewis who has published many books and research papers and specialises in the study of climate change as evidenced by landforms and other features. He has published articles on the history of St Helena’s natural environment and the carbon content of the ocean surrounding the island, so you couldn’t be in better hands exploring this isolated and wonderful island. There are only a few places left on this brand new Birding Tour, developed to introduce you to the natural wonders of St Helena. See nesting seabirds and the endemic Wirebird as well as the many endemic and endangered plant species found on the island of St Helena. The tour is led by Alastair Kilpin who has travelled extensively, soaking up the natural world. He managed a large community-owned wildlife concession in the Serengeti where he trained guides and led walking safaris. He will be accompanied by other enthusiasts from St Helena National Trust. Book now to avoid disappointment. The popularity of the RMS St Helena continues to rise and to satisfy the increased demand, seven new passenger cabins were added during its 2012 dry dock. To accommodate the new cabins the doctor’s surgery was relocated and a brand new gym fitted on the funnel deck, offering spectacular views of the South Atlantic Ocean. So you can now pedal or power walk your way to fitness in one of the most amazing and inspiring gym locations. IT IS a magic moment. A strong hand plonks on my shoulder. I look down to see two incredibly long arms reaching up and a young orang-utan pleading to be picked up. With arms around my neck, two beautiful black eyes peer quizzically into mine. Never take wild animals for granted. The Arctic is no zoo and these passengers had a lucky escape. Pay attention to your expedition leader. G Adventures , the leading small-group adventure travel tour operator, is offering travellers a free flight between Lima and Quito (or Quito to Lima) for any Peru Itineraries booked in conjunction with a tour to the Galapagos Islands. The offer is valid for trips departing in 2013 and gives travellers a great opportunity to experience the wonders of two of the highlights of South America – The Galapagos Islands and Peru - together. Pete Rawley, Head Honcho of G Adventures Australia / NZ, says “This is another example of how G Adventures innovates our product and leads with service so we can offer both agency partners and travellers the best possible experience”. One-way tickets are available between Lima and Quito for up to 30 days between the two tour dates, allowing travellers the flexibility to spend a few extra days seeing the highlights of the area. 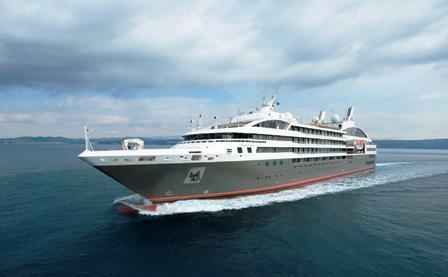 Compagnie du Ponant has introduced its second partnership with French magazine Cuisine et Vins de France. In 2013 the new Gastronomic Odyssey onboard L'Austral sails around Andalusia, the Balearic Islands and Costa Brava in the company of experts from the leading gastronomic magazine. The program includes gala dinners by the most talented Michelin-starred chefs of their generation: Emmanuel Renaut, the only chef to have received three Michelin stars in 2012, and Christopher Hache, chef at Les Ambassadeurs restaurant at Hôtel de Crilion in Paris, who has already received one Michelin star. The gourmet journey will include three conference and tasting sessions of great champagne houses anbd excellent wines from the Bordeaux region, and introducing Spanish wines. These sessions will be hosted by Karine Valentin, Cuisine et Vins de France wine journalist and renowned wine expert and famous wine consultant Olivier Dauga. The eight night experience from Malaga (Spain) to Marseilles (France) from 13 to 20 April 2013 with prices starting from AUD $3,268. 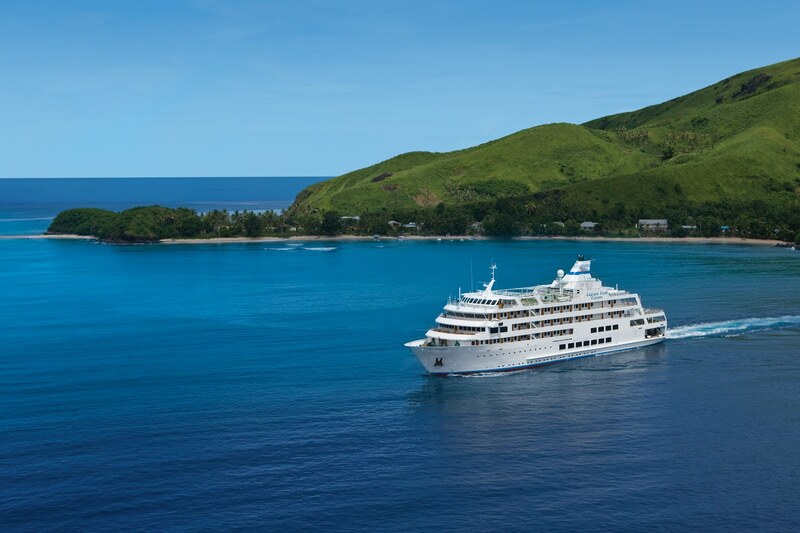 Captain Cook Cruises, Fiji is embarking on the first ever Discovery Cruise, to a part of Fiji never seen by tourists before*, the pristine Lau group. The cruise onboard the MV Reef Endeavour is scheduled to depart on 22 October, 2013 for 11 amazing nights. "Captain Cook Cruises is so excited to be able to offer the first ever cruise around the Lau Group of Islands. We have worked really hard, using local knowledge and advice, to put together a fantastic 11 night itinerary that will not only show off everything Lau has to offer, but that will allow passengers to experience a remote and unspoilt part of Fiji." Says Jackie Charlton, Managing Director of Captain Cook Cruises, Fiji. The Discovery Lau cruise departs Tuesday 22 October 2013 at 1.00pm from Port Denarau and disembarks on Saturday 2 November, 2013 at 9.00am at Port Denarau. The 11 night cruise is priced from $3430 per adult twin share, children 5 -17 years sharing with adults are priced from $730 per child and children under 4 years are priced at $1200 which includes a nanny service. Prices include accommodation, all meals, daily stopovers and water activities, guided village, school and island tours, glass bottom boat excursions, Marine Biologist and cultural talks, child minding during meal times (5 -10 years), on board entertainment and use of the ship's facilities including swimming pool, spas, pool bar, sun deck, sauna, cocktail bar, day spa and library. STEVE Lloyd is in a celebratory mood as he casts an eye over the top deck of his sleek new ship as it meanders up the mighty Mekong River though Vietnam en route to Cambodia. "We were ambitious when building," Lloyd grins. He has every reason to be pleased with himself. Hours earlier, Buddhist monks blessed the Cruiseco Adventurer before it was christened in port at My Tho, near Ho Chi Minh City, in Vietnam. The luxury, 60-berth riverboat is at near capacity, with 48 passengers from Australia aboard for its maiden voyage. The Sea of Okhotsk, directly north of Japan and bordering Russia's south, is ice free for just a few months a year, and the open waters of spring are ideal for expedition travel in search of indigenous wildlife. Heritage Expeditions pioneered expeditions to the Russian Far East and remain the most experienced and knowledgeable operator offering voyages to one of the last frontiers for travel and adventure. The small numbers ( 50 PASSENGERS) aboard the Spirit of Enderby guarantee you more landings and more time ashore to experience, observe and enjoy. Their Sea of Okhotsk voyage departs 5 June to 21 June 2013 with cabins from US$8300. APT has released its first small ship expedition cruising brochure following the June investment in the Noble Caledonia and its specialists ships Caledonia Sky and Island Sky. The May 2012-refurbished 110-passenger/74-crew Caledonia Sky is the main ship featured in the brochure -- APT Luxury Small Ship Expedition Cruises 2013-14 – specifically for the Australian and New Zealand market for cruises covering the regions of Indonesia, Papua New Guinea, Australia's Kimberley coast, and Japan while the Island Sky offers a circumnavigation of Cuba. APT General Manager Marketing, Debra Fox said APT was providing the best of two worlds in this program: APT's hallmark high standards of travelling style, comfort, service and all-inclusive pricing that has evolved from 85 years experience; and adventurous and life-enriching encounters with some of the world's most isolated and inaccessible regions. "This combination will top the bragging rights," she said. "It pushes the boundaries of conventional travel." Of the ship, Ms Fox said "it feels like a private yacht or a fine Country Club", it is equipped with an International fine dining restaurant, lounges and sun decks, offers five different cabin styles, each suite is at least 216 square feet which is almost twice the size of suites on standard big ships, all cabins have WiFi and flat screen TV, and an elevator services all decks. It visits smaller ports where big ships cannot stop because of their need of greater facilities and infrastructure. As a result APT will bypass the mass tourism circuit and is able to take advantage of ad hoc opportunities. On the service side, all passengers can undertake excursions at the same time because it has 10 onboard Zodiacs and expeditions are led by experts (marine biologists, historians, geologists, anthropologists, explorers or botanists etc). Prices include cruising, all meals, onboard lectures, tipping, gratuities, shore excursions (Freedom on of Choice Sightseeing Inclusions) and house wines, beers and soft drinks with all lunches and dinners. Each departure is a one-off which APT says makes the APT expedition program the most specialised on the seas. Fly free deals and discounts ranging from $250 to $1050 per person are offered for early bookings, expiry dates for which are between December 31, 2012 and April 30, 2013. Lead-in cruise is the 14-day South East Asia Explorer (from $9995 per person, twin share, departing September 25, 2013) which cruises from Darwin to Singapore, following a route similar to "The Journey of the Krait", one of the most successful covert operations in Australian military history. The 19-day Beyond the Dragon's Lair (from $13,959, departing February 13, 2014) starts in Jakarta and finishes in Port Moresby. An 11-day Kimberley Coast cruise (from $7995, departing September 5, 2013) has 13 and 15-day options which include Darwin and/or Broome, while the 28-dayGrand Kimberley (from $17,395, departing August 19, 2013) includes an 11-day coast cruise and 17-day 4WD land tour with Kimberley Wilderness Adventures. The 16-day Japanese Spring Gardens (from $11,995, departing April 17, 2014) is a cruise organised by APT's sister company Botanica. It starts in Kyoto, cruises the southern waters of Japan, sails to South Korea and then cruises along the west coast of Japan. Also in the brochure are the 15-day Spirit of the Spanish Main (from $10,295, departing January 25, 2014) which starts in Nassau and cruises through The Bahamas, around Cuba to Mexico and Belize, and the 27-day Cuba and Mayan Adventure (from $17,795, departing January 22, 2014) which offers a city stay in Miami, the cruise and a ten day land tour of Belize and Guatemala. These Cuba cruises are on Island Sky, which is almost identical to Caledonia Sky. To complement the extensive sightseeing already included, APT provides a collection of handpicked Signature Experiences for a genuine immersion in each destination. Widely diverse, these activities are featured at no extra cost. One expedition offers the chance to roam the wilds of Rinca Island to see the fascinating Komodo dragons. Another adventure takes travellers to meet local Papuan tribesmen on an authentic village experience. In personalising the expedition experience, APT also offers a range of different Freedom of Choice Sightseeing Inclusions – from rounds of golf and cooking classes, to military history tours and a Papuan Sepik River experience. Lindblad Expeditions-National Geographic has announced a special offer of free roundtrip airfare to Galapagos on select expeditions aboard the National Geographic Endeavour. Book by December 31, 2012 to receive free roundtrip air between Miami/Galapagos on the following 2013 departures: January 11, January 25, February 22, March 15 and April 5. Consistently rated one of the world’s best island destinations, Galapagos is like being in the ultimate zoo without the fences, and offers unprecedented proximity to wild creatures that exhibit no fear of humans. And with 40+ years exploring Galapagos, Lindblad Expeditions’ profound knowledge of the destination provides guests a unique, richly immersive experience and a life changing adventure for all ages. 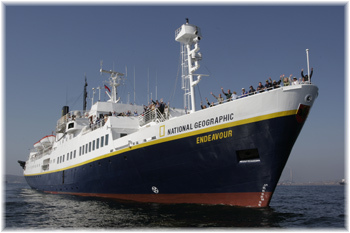 The 96 guest National Geographic Endeavour offers year round 10-day expeditions in Galapagos.